as has become a Labor Day tradition for us. which ruled out the most obvious wardrobe choices for fall apple picking. just to make sure it feels right... and is fun to wear. with only an hour before we were all set to leave. by feeling completely at odds with what I was wearing. which meant my red sun hat would be perfect..
form apple picking... to lunch and some shopping. You look ready for anything in that outfit. 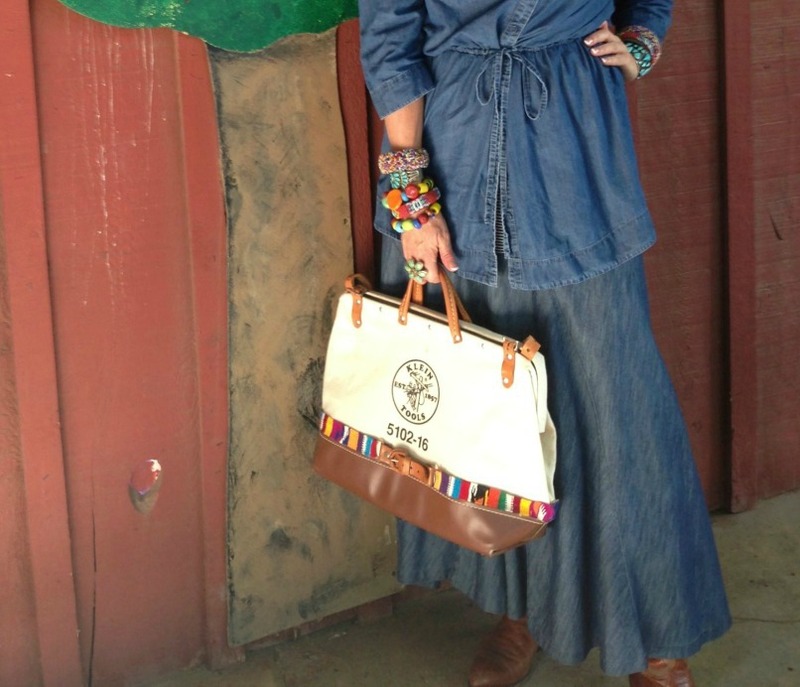 Love all the colorful arm action going on here with your denim...very "Primitive Glamour"
What wonderful fun! Elegant apple picking attire. I love all the colours on your bracelets and hat. The hat is spectacular. Darling outfit Tamera, great for lots of other occasions as well! 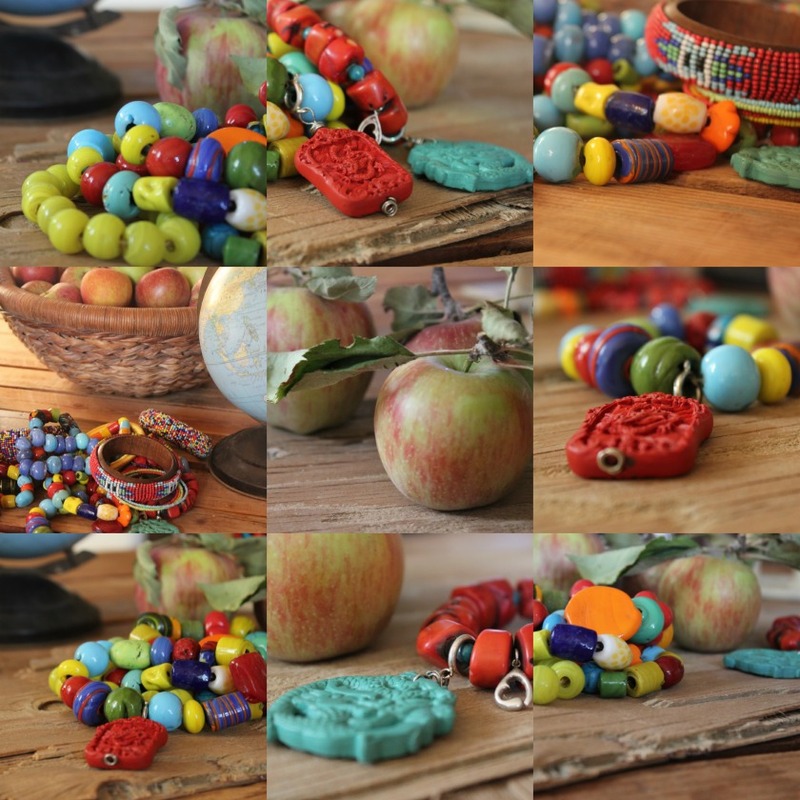 I adore everything about this post, Tamera...the idea of being able to pick apples, the seasonal feel to it, and, of course, your outfit and jewelry...loved every minute of it!!! 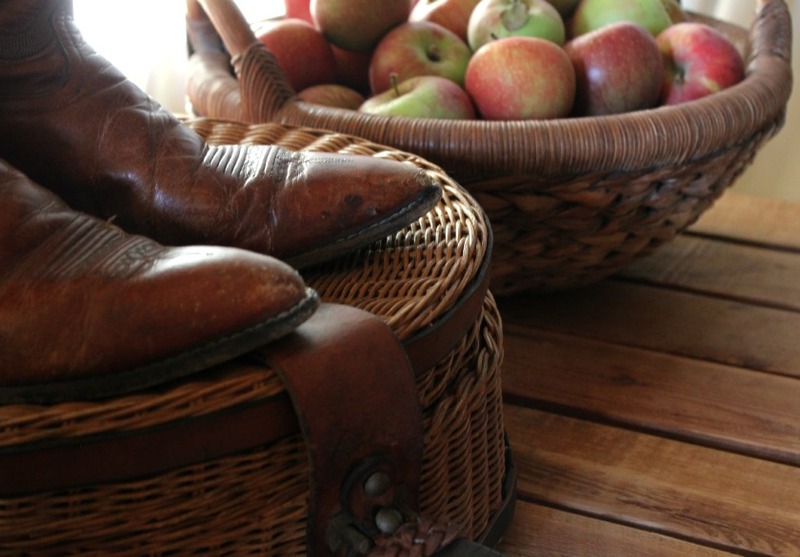 After all your deliberations, you chose the perfect outfit for apple picking, from the top of your magnificently be-hatted head, to the tip of your cute booted toes! Oh WOW, what a fabulous look! The bracelets are the perfect exclamation point of color. 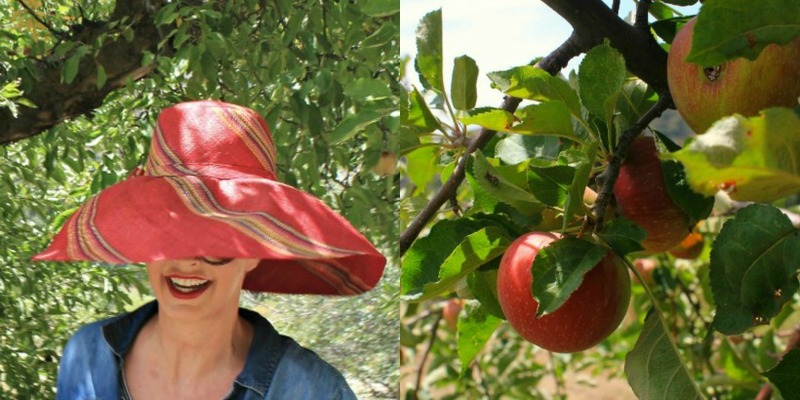 Love this idea for an apple picking hat. Large brim, perfect for keeping sun off your face in the orchard. I love, love, love this post! 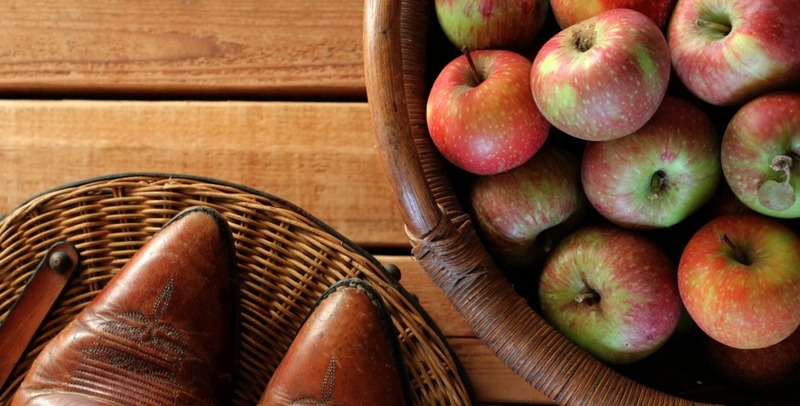 Partly because I loved the original apple-picking post and I like the chance to read it again. But also because I think it really gets that mix of showing What we Wear and the backstory, always at least as interesting, of Why and How we Wear it. And if I can squeeze in one more reason: because you look fabulous and your photos, layout, etc. are so scrumptious. Thank you! I have seen many colour of that hat, but none quite worn as spectacular! What a stunning post! 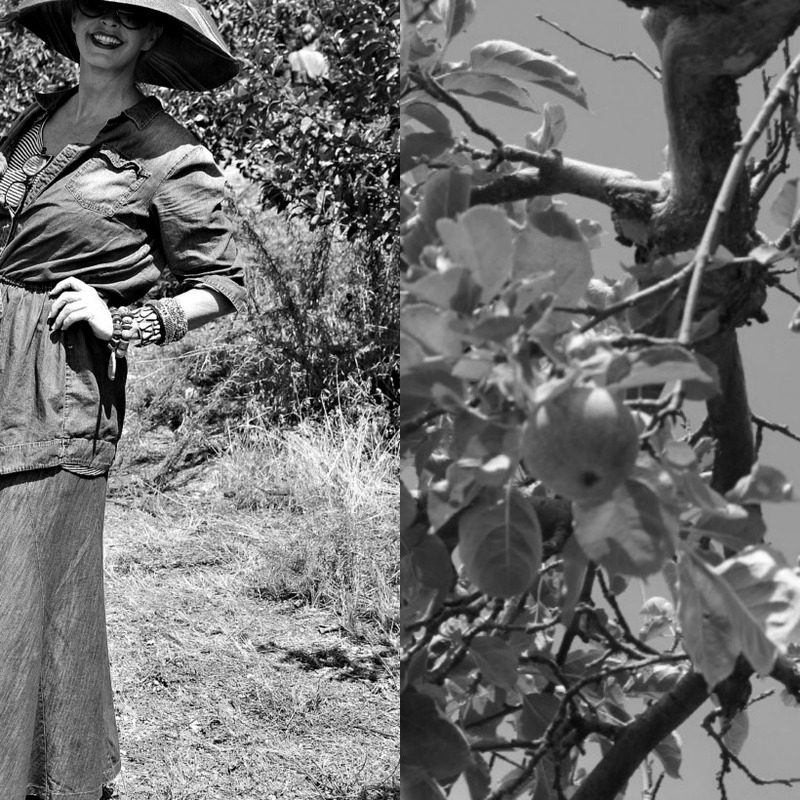 Oh I adore these autumnal photos, you in that lovely orchard looking ravishing in that incredible hat! I love the hat and cowboy boots, colorful bracelets, bag ... oh just the whole ensemble. 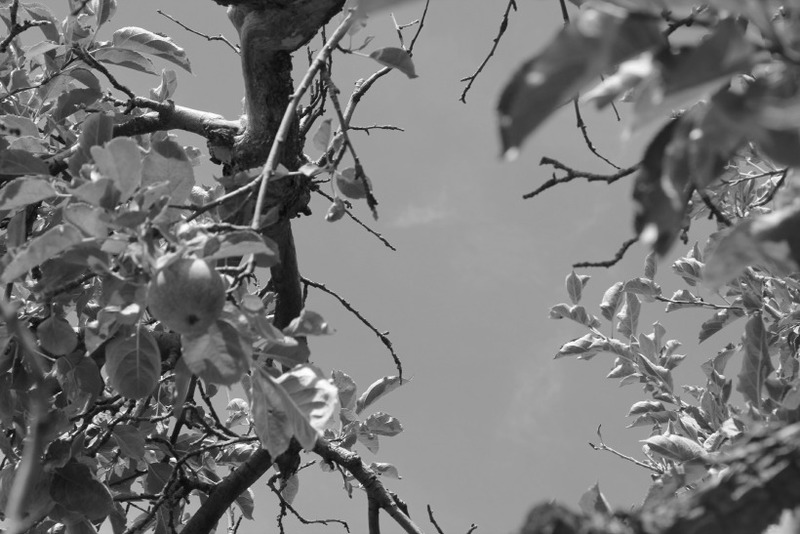 I had my first apple picking experience a couple of years ago and it was so much fun. I adore the ethnic details of your accessories and the denim background does them justice. Definitely an artistic result.I hope I don't sound too serious. I simply love everything about this post. What an artistic woman you are. So happy I have discovered your blog. You are a true inspiration for me and Mimi. 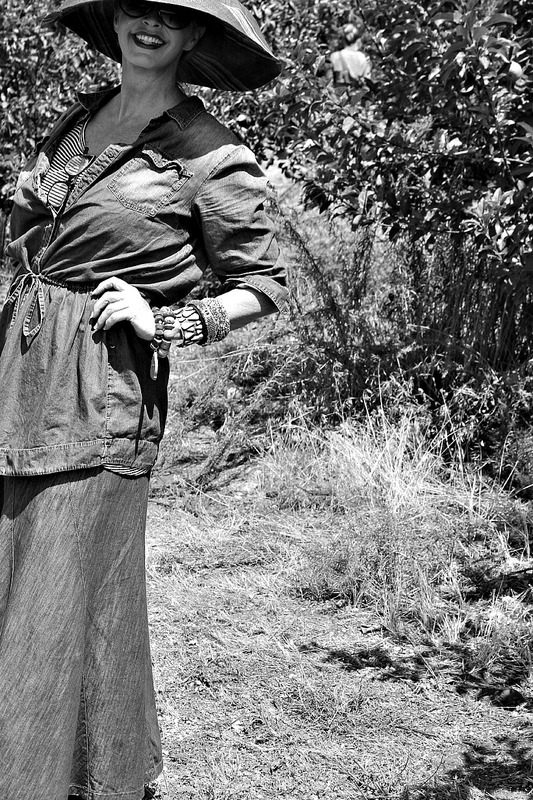 Love, love, love the bracelets and boots. 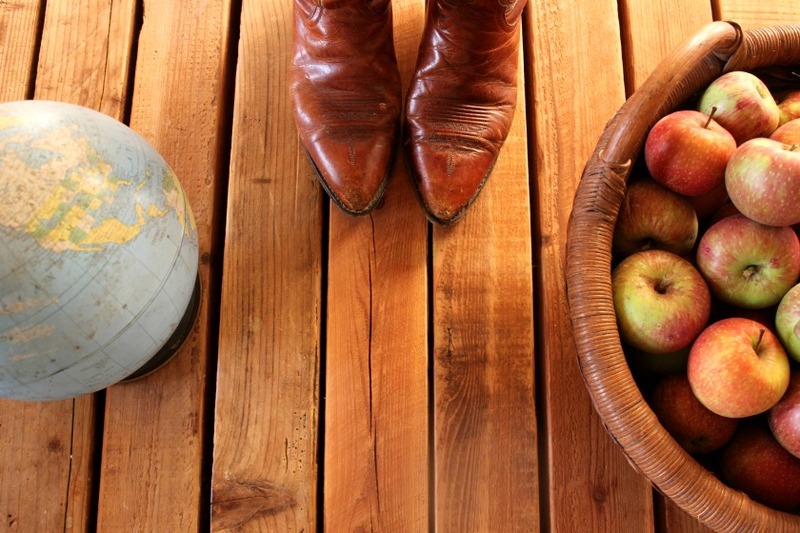 I am a boots woman; especially worn in boots like yours. The whole outfit is perfect on you, capping it off with a great hat. So cute, you cottin' pickin' little apple picker! Adorbs! 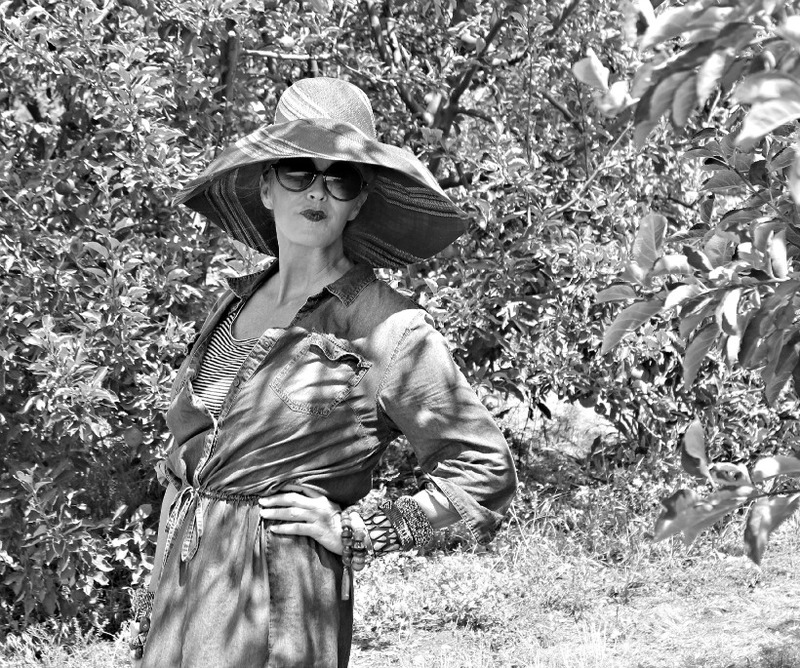 Trust you ... picking fruit, looking still like a supermodel. All that beauty, and thoughtful presence as well. Lovely. 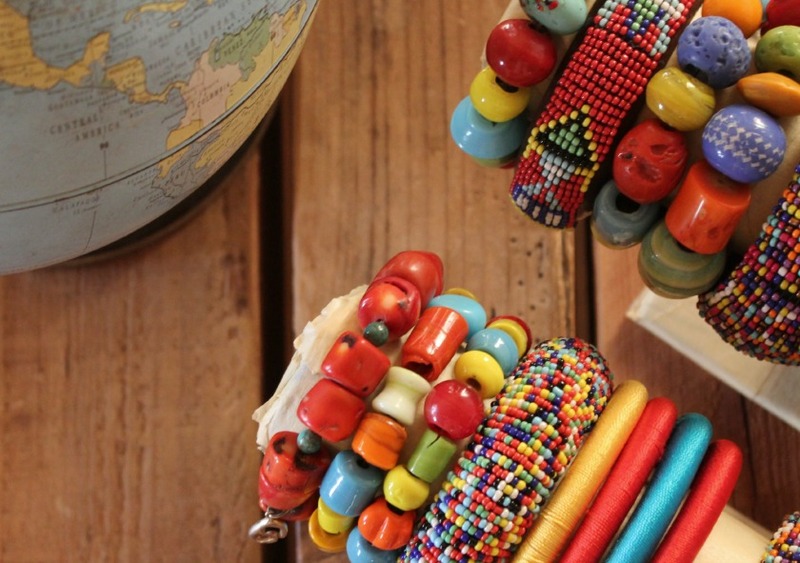 Fabulous bracelets. Gorgeous photos. Uniquely written post. Where have you been all my blog-life? Oh Tamera, you look stunning! I love the arm candy, yes indeed, fabulous bracelets. And I'm definitely going to use your carpenter's bag for inspiration for one of my own handbags! Last week, we went to a local winery for sangria and appies...I changed three times. I totally get you wanting to be comfortable, dressed for the occasion and adorable to boot! You look great! 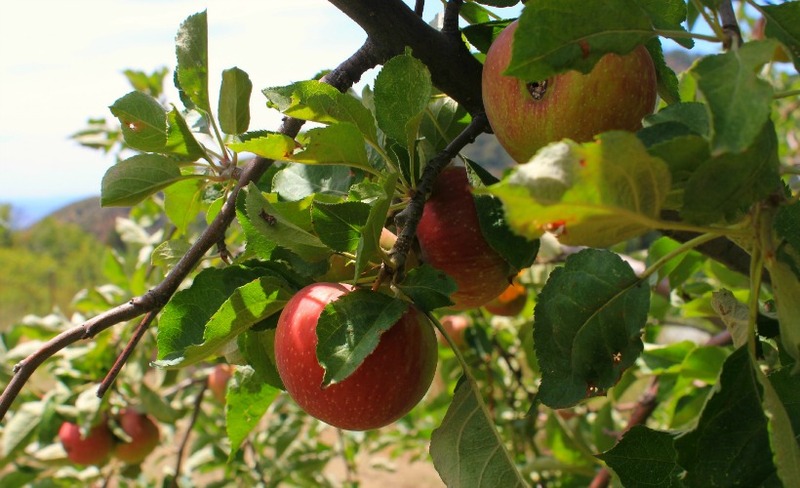 I can't wait to go apple picking! Come visit me today and support this single mom Alissa by liking her page pretty please???? Perfect apple pickin' garb! I so wish we had apple orchards here!